MotiveWave is arguably the best desktop trading software for both Mac and PC. From the technical analysis tools to the range of brokers it supports, MotiveWave is a highly accomplished stock and forex trading tool. If you want something that can not only perform in-depth analysis of stocks, shares and Forex, MotiveWave is an amazingly powerful tool. What we like about MotiveWave is that unlike many technical analysis software, it not only offers amazing TA tools but it’s also integrated with brokers so that you can actually trade from it at the same time. It’s also one of the few stock trading software to have a dedicated Mac app although it also works on PC too so this review will be of interest to Windows users as well. Here we take a closer look at what MotiveWave can do and show why it’s one of our favorite stock trading software. MotiveWave has just about everything you could want in a trading software including advanced technical analysis tools such as Fibonacci, Gann, Wave, Ratio Analysis and Gartley. It also has scanners, back testers, walk-forward testing, paper trading simulator and many more. That’s not to mention that it’s one of the few apps that’s integrated with many major online brokers so you can actually trade from it too. Although the most complete MotiveWave plans don’t come cheap, you get a lot for your money. The main MotiveWave console allows you to organize your charts, watch lists and other modules in one windows. The console is very flexible allowing you to add lots of different TA components and then move them around to the position you want. The range of charts and ability to annotate, adjust and drill down them is superb in MotiveWave and only TradingView does charting better in our opinion. You can view pretty much any type of chart including time, momentum, range, volume, percentage, and range-based charts. You can even create seconds based charts that are incredibly effective for scalping. MotiveWave allows you to organize and manage layouts using the Pages Bar at the bottom of the Window. Several pages can be created as part of the default layout. MotiveWave even provides examples of layouts that you can edit and customize with components. In addition to this you can also add “Panels” and clicking on a tab will activate a new panel. This allows you to really pack MotiveWave with information and analysis that you can recall in a click. One of the things we really like about MotiveWave is that it actually allows you to trade from it, thanks to integration with a range of brokers. Most stock trading tools only allow you to perform technical analysis and require a separate trading account with a broker to actually trade with. Stock broker integration is available in all versions of MotiveWave although you’ll need the Trade Edition or above to actually place trades. MotiveWave allows you to place orders with your broker directly from the console. You can connect to as many brokers as you like simultaneously and manage all accounts, orders and positions from one location. You can have more than one broker or data service connection within the same workspace but note that this multi-broker workspace feature is only available in the Professional and Ultimate Edition of MotiveWave. For the lower editions however, you can create a separate workspace for each connection and you can still have as many connections as you want. Another nice touch to trading with MotiveWave is that you can also manage and adjust orders directly from any chart. 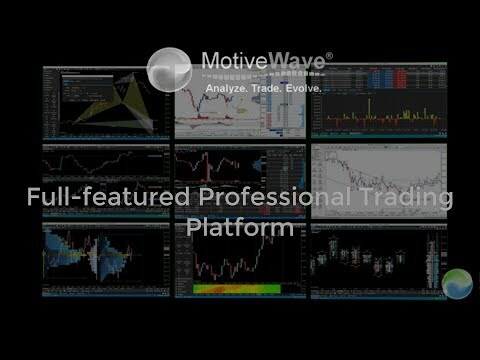 You can find a full list of brokers supported by MotiveWave here but they include major brokers like Oanda, Forex.com, TradeStation and Direct FX. Apart from this, MotiveWave also connects to Data Feeds including Google Finance, Yahoo Finance and StockWatch. One of the most impressive aspects to MotiveWave is the range of technical analysis tools available. In particular, the Elliot Wave Tools are some of the most impressive you’ll find anywhere. Elliot Wave labels are added automatically and there’s even an Auto Analyze Elliot Wave Tool that will automatically plot Elliot Waves. There are many other TA tools available in MotiveWave too including Gartley tools for Harmonic Shape analysis, Fibonacci tools, 29 Gann components and tools for alternate scenario analysis. There are 6 different versions of MotiveWave: Charts, Charts+, Trade, Strategy, Professional and Ultimate. If you want broker integration so that you can trade you’ll need either the Professional or Ultimate version. MotiveWave pricing ranges from $99 for the Charts version up to $1595 for the Ultimate Version and all plans are for a lifetime license. It’s unusual to find lifetime licenses in any type of trading software so all plans offer very good value for money viewed over the long-term. Plans are paid on an annual basis but you can now subscribe to the Charts Plus, Trade, Strategy, Pro and Ultimate version on a monthly basis too. You can see how the different editions compare here. You can also try MotiveWave Ultimate Edition for free.